The Epson WorkForce Pro WF-C5290DW Printer is a speedy, small, workgroup printer designed to help reduce printing costs and environmental impact. Aimed at all sizes of businesses, from large corporate entities to small offices, the way it's designed will help cut any organisation's environmental impact. Its fastest first page time out is 5.3 seconds for colour and 4.8 seconds for monochrome, and it can print up to 10,000 pages in black and 5,000 in colour without changing ink supplies. Designed to make mobile printing easy, the printer can link to a variety of tools to help manage remote devices and control security. You can use an Android or iOS mobile, or tap and print using an NFC, in order to print documents from anywhere. Security is key to any business, and you can ensure confidential printing with PIN code release, Panel Admin Mode or Epson Web Config. This compact Epson WorkForce Pro WF-C5290DW Printer model weighs 425 x 535 x 357 mm (width x depth x height), so it won't take up a lot of room in the office, and it weighs 15.3 kg. Its two paper trays have a standard paper input of 330 sheets between them, and the output tray capacity is 150 sheets. The monthly duty cycle is between 250 and 2,500 pages per month, although it can go up to a recommended maximum of 45,000 pages per month. 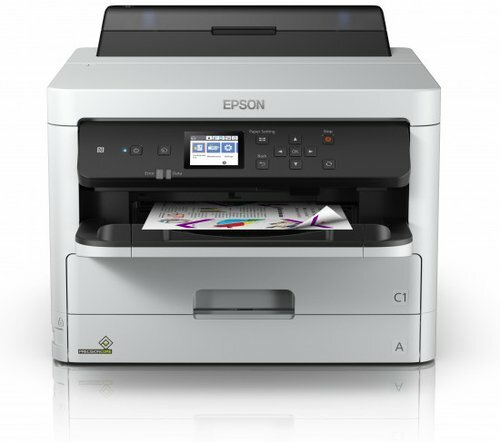 Compared to similar laser models, the Epson WorkForce Pro WF-C5290DW Printer can help businesses save around 50% at least on cost per page, and the fact that it is designed for workgroups means that the centralised printing can help reduce hidden employee costs. Using up to 90% less power than competitive models, it also saves time with an automatic double-sided mode. Despite its compact size, the printer is more suitable for business than home use.